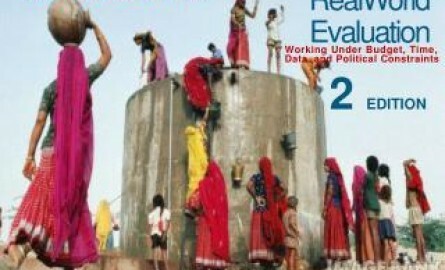 Real World Evaluation: Working Under Budget, Time, Data & Political Constraints. Michael J. Bamberger, Jim Rugh, Linda S. Mabry 2nd Edition. Sage Publication,2012. There are many evaluation books, handbooks and manuals written around the central theme of ‘quest for ideal evaluations’ employing the best approaches, designs and methods. However, few acknowledge the ‘real-world’ in which evaluations are commissioned and implemented. This realistic orientation is what distinguishes ‘Real World Evaluation’. Organized in three parts, the book is targeted at evaluation practitioners,users,managers, and researchers. The first part is the focal of the book and describes the seven steps to real world evaluation approach. It acknowledges the fact that evaluations are conducted in constraints and provides practical advice on doing justice to the evaluation purpose and scope in multistakeholder scenarios. Taking cognizance of the constraints, it is the ‘most appropriate’ and not ‘the best’ that is underscored by the authors. It addresses critical questions and issues comprehensively across the evaluation cycle, and presents methods and strategies for addressing the key issues identified and combinations thereof. The second part of the book is a compendium of evaluation methods and approaches examined with a ‘real world’ lens. It presents a rational view of the various methods and approaches looking at all the facets and caveats associated, all with a real world perspective. Embedded in theory and referenced in literature, the contents are sufficiently detailed. Practical insights are provided sharing experience and wisdom while making a case for use of program theory and mixed-mithods in evaluations. The third part of the book is on managing evaluations and evaluation capacity development and is more for evaluation managers and funders. It ends with a conclusion that is a succinct recap of the whole book and prescribes a way forward. Aglossary is also provided at the end defining all the technical terms. Annotations to further readings provided in each of the chapters are a value-add and make it more useful. However , cross referencing in the text, especially in the first part could have been eased a bit, even at the cost of introducing redundancy as this requires going back and forth. Also, the analysis section both in the quantitative and qualitative methods could have been better detailed so as to do justice to this critical aspect of evaluation, on the lines of the chapter on sampling. In all, RWE is ‘ a practitioners’ guide to pragmatic evaluations. Welcome to the real world of evaluations.